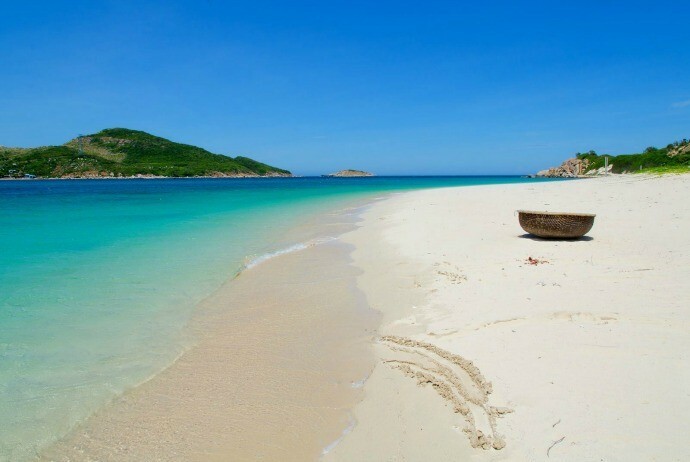 Hong Van (Hồng Vàn) beach becomes a charming destination for tourists going to Co To (Cô Tô) Island, Quang Ninh (Quảng Ninh) province, Vietnam (Việt Nam). The beach has a fine white sand beach featuring crystal blue water. The purple glory flowers here make Hong Van beach much more romantic. Being an archipelago situated in the east of Van Don (Vân Đồn) Island in Quang Ninh province, Co To Island has an area of 47.3 km2. Having over 50 large and small stone islands, Co To nowadays becomes an attractive destination in the northern tourism map. Tourists visit this beautiful island more and more, along with a strong development of tourism and rapid urbanization of a peaceful seaside town. The flip side of the “hot” development was the hustle and bustle which could upset those people looking for a true vacation. However, besides the noise of the rhythm of daily life, it is still seen peaceful, quiet pictures of a zone with blue water and white sand. You could still soak up the romantic nature where time seems to stop, in order to have moments of real relaxation after a stressful working day. 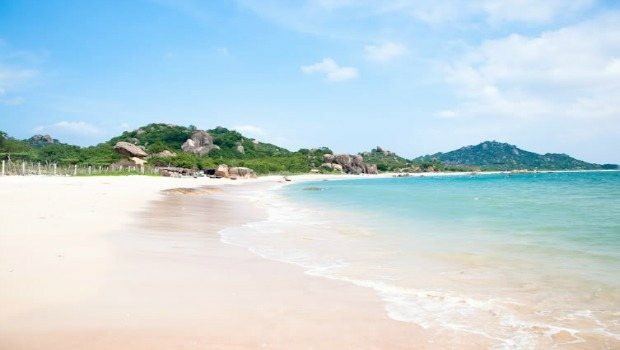 Located far away from the populated areas, with stretching sandy beaches, safe and calm sea, Hong Van beach is located in Hong Hai (Hồng Hải) hamlet, Dong Tien (Đồng Tiến) commune, Co To district, is becoming an ideal destination for tourists when traveling to Co To Island. On the beach, there are wooden houses designed creatively, which are very close to the nature. These places are where you just need to open the door, then you can immerse yourself in the blue, cool seawater. In order to experience more of the wonderful nature of the island, you could kayak or dive to contemplate those lovely, colorful fishes weaving in the “seaweed” forests waving in each wave. The dinner is the most romantic time on the beach, when you could enjoy a feast of fresh seafood with shrimp, squid, snail and fish in the shimmering light of hurricane lamps arranged very subtly. Hong Van beach belongs to Hong Hai (Hồng Hải) commune, about 7km far away from Co To Town. From the port, you could rent “xe om” (xe ôm) (motorbike taxi) with the price of about 50,000 VND. At the beach, there is a service area serving main meals with the price from 150,000 VND / person. From here, you could hire a motorbike (200,000 VND/day) (including petrol) to visit other tourist attractions such as the lighthouse, Van Chay (Vàn Chảy) beach, Cau My (Cầu Mỵ) rock beach, walking around the nearby fishing villages….or hiring a small boat and diving to contemplate fishes with the cost from 600,000 VND – 1,200,000 VND (depending on the destination). From Hanoi, you could travel by bus from My Dinh (Mỹ Đình), Gia Lam (Gia Lâm), Luong Yen (Lương Yên), Giap Bat (Giáp Bát) bus stations to Cam Pha (Cẩm Phả). Then, transfer onto local buses or taxis from Cam Pha to the Van Don postal which is 20 km far away. Then, walk or take a motorbike taxi to Cai Rong (Cái Rồng) port of about 2 km far way. From Cai Rong (Cái Rồng), you could buy speedboat ticket and it takes about 1 hour to arrive at Co To Island. During the peak tourist season, you should book boat and hotel in advance at least 2 weeks to ensure the best service.